It's starting to feel pretty close now - just 7 weeks today until our Ironman Ultimate Challenge kicks off with Ironman 70.3 UK Wimbleball. To keep the number of unknowns to a minimum, Mrs and I decided to book ourselves onto a familiarisation day to check out the area and the routes. In order to simulate race weekend as well as we could, we booked ourselves in to the same place we have lined up for the event weekend. We took a steady drive down on Friday afternoon and checked in to the Anchor Inn - a nice little place on the Devon and Somerset border that's been transferred to new management around 10 weeks ago. Ann and John, the new proprietors, are slowly turning the place around following a few years of limited investment and care. It's still very quiet, most of the 6 guest rooms were unoccupied, and the bar was very quiet - but they've already made some significant changes in decor and the grounds to start bringing it up to spec. On a nice summer's day with tables down by the river I think they're going to do a roaring trade. So, that's one less worry for race weekend - our accommodation will be fine. I'd include a link, but their website has mysteriously disappeared - maybe that's the next thing to be refreshed. The familiarisation event, organised by The TriLife and Ironman UK wasn't until Sunday, so Saturday involved (somewhat predictably) a parkrun. We got up nice and early for a tourist trip to Killerton parkrun (though not as early as you need to get up to cycle to Eastbourne parkrun). The lanes were great fun to drive round, I don't get to "play" in my car very often, so it was nice to have the opportunity (lots of blind corners and agricultural surprises though - stay alert, people!). Killerton parkrun is beautiful. It's on National Trust grounds and follows trails, winds around fields, and narrow tracks. The last 500m drops you out through a hedge (don't worry, there's a gate) and the finishing stretch is down past Killerton House. Mrs and I ran together all the way - no point in racing, got a busy day tomorrow - and she graciously let me win by 1 second, paying me back for when I let her win in similar circumstances back in frozen Sheffield when we ran Concord parkrun in -5C. We used the afternoon to cycle up to Wimbleball Lake. The hills were short, and extreme. It was only about 11km but still took about an hour in each direction. It was immediately apparent that my bike was not set up for this kind of terrain. I'd decided to bring my TT bike rather than my road bike. The theory being that if I'm not sure if it's TT bike suitable, I should find out now, rather than bring my road bike and try and work out if I could have done it on the TT bike. I have hardly completed any hill work on this bike, so it took a while to get my position right, particularly when climbing out of the saddle. I found a technique fairly quickly, and was soon able to climb without hitting my bum with the saddle or banging my knees on the arm rests of the extensions - a good start. My gearing however was way off - with an 11-23 on the back I was crippled for low gears. Observation number 1 is that I'll definitely need to get an 11-28 on the back for this course! The lake was calm and pretty. There was a little café where we had a cup of tea, and collected ourselves before cycling back to the pub. We were both hoping that the route didn't entail 56 miles of this kind of terrain - that would be a real nightmare. There was no flat whatsoever - all steep up and steep down. We had a hearty meal for dinner, and got an early night - we needed to be at there lake for 7am. Ann and one of the bar staff brought us up a cold platter for breakfast. Cereal, breads, jams, macaroons, and lots of milk for tea. This was a lovely touch - we'd only expected some cereal! Morning came and we ate and drove up to the lake. Already having ridden the route yesterday was a bonus as we knew where we were headed. First up, after a short briefing, was a swim in the lake. We were all a bit nervous - it was seriously cold. The lake was at about 9C - 8 or 9 degrees colder than it would (hopefully) be come race day. With wetsuits on, we warmed up with some jogging, press-ups, high-knee jogging, and burpees. Normally this level of exercise in wetsuits would turn us into gasping sweaty messes - but it was so cold we were only just about staying warm. Without further ado we tentatively entered the lake. A couple of buoys were set out in the same shape as they would be in the race, but much closer together. We had about 200m to swim in total. We started from the same place as the race starts - between two pontoons. It's a long time since I'd swum in open water, so I needed to remember sighting, what it's like swimming right next to other people, and how to swim in a straight line. I got round the course, but was getting very cold. We did a few drills afterwards between the pontoons - swimming backwards and forwards in a pack. I had one panicked moment with a couple of failed breaths and then a lung full of lake water - the shock of the cold made me cough a lot, and I started wheezing a fair bit. There were only two more exercises left so I stuck with it, but I'm very glad that it's going to be warmer for the main event - it would be no fun in this temperature. We'd only been in 15-20 minutes total and my hands were bright red and swollen, and I couldn't feel them or use them for anything. Still, it was good to see the start, get a feel for the run up out to transition, and get a first swim done in my new wetsuit. Next, a quick change into cycling gear, top-up snack, and get the bikes out of the car ready for assembly (putting the wheels back on) and heading out to ride a lap of the bike course. This was the main reason we were here. Everything we've read about Wimbleball goes on and on about how hard the bike course is. Not an article goes by without some sentence like "52 hills in 56 miles" or "the hardest 70.3 course in the world". It would be easy for these comments to build up into a major psychological problem - how hard is the bike leg going to be? If every report and review says it's so hard, it must be almost impossible! How hard is it compared to, say, The Hell Of The Ashdown? The only was to find out, was to come and see. So, with much trepidation (not helped by yesterday's ride! ), we kitted up, clipped in, and set off. The objective wasn't to race round a lap, but to become familiar with the course. The instructors set the pace for the most part, and stopped to point out landmarks, give gearing advice, and talk strategy. We set off slowly, and after the first climb and descent split into two ability groups. There were about 8 in my group, and about 5 int he second group. To be fair there wasn't that much of a difference in ability between us. It seemed like we stayed about 5 minutes ahead all the way round. So what of the course? Well, it is tough, there's no denying that - but it's not like the crazy short sharp ups and downs we'd ridden the day before. The first half is fairly rolling with good surfaces. There is strong local support for the event - the council come and fill all the potholes a few weeks before the race, do another check a few days before, and even sweep the circuit the day before! There's no call for over-confidence though, in previous years there have been torrential downpours before (and even during) the race, and that just washes all the crap back across the road. 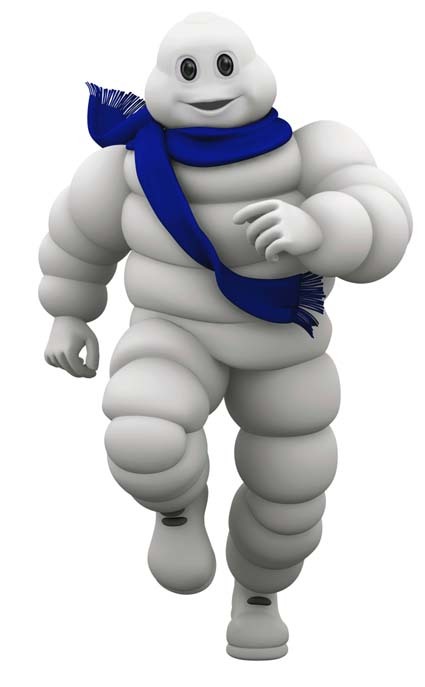 We heard a few times - good tyres are essential, don't pick anything too lightweight and insubstantial. A puncture will knock out any seconds gained by saving a few grammes on tyres, and plenty more besides. From memory there are three large climbs that stand out among all the small ones. Only two of those stick in my head as being long slogs out of the saddle in 1st gear - on race day I want to be able to get up these hills without rising out of the saddle unless I decide I want to (change of position, little burst of speed, or to relieve an ache or cramp) - a timely reminder that a wider ratio cassette is an absolute requirement. With lots of ups comes lots of downs. Some of the descents are very (very!) fast - and today in the rain (and occasionally hail) was not the day for showboating. On a few of the downs I had both brakes on full, and was still barely slowing down. Second essential thing - very good brakes, and confident stopping power. I'd been considering riding on wheels other than my current race wheels (HED H3C front and H3CD rear) because they have carbon braking surfaces. Performance is quite "grabby" and feels a bit like ABS in a car, and I would not feel confident descending at speed and stopping under hard braking. They're incredible for flying along in a time trial, but not so great when it gets technical. We had a car out with us that had some supplies in the boot, so it parked up where each of the aid stations will be. This was very useful as it helps break the circuit into manageable sections. There are two aid stations, each of which is passed twice. We pulled back into the lake - tired and wet, but very pleased with the ride. I finally had some context for the reports, and something to visualise between now and race day. It's hard, but it's not impossible. Key on the day will be managing effort in lap one, and making sure I don't burn all my matches in lap two, as there's still a run to come. After lunch at the café and some chat back in the classroom with the TriLife crew and then the Ironman crew who are organising the race it was time to run a lap of the run course. All the press is about the bike course - today I learned that some hills were saved for the run too! It's a mixed terrain course, 3x7km (approx) to make the half marathon distance. There are a few dead turns (stopping to change direction 180 degrees round a marker), and a lot of technical sections - uneven terrain, mud and grass, inclines, adverse camber - you name it, this course has it! However, much like the bike course, I now know what to expect come race day. When my head is all over the place, and my body is full of adrenaline, I will hopefully remember today - the experience has been invaluable, and I have far less to be concerned about in my head than I would have otherwise. It will still be a big day, there is still a lot to learn as racing a course is very different to just going for a look, but I think as a first timer over a new distance this was definitely the right thing to do, and I'm very pleased we made the effort to come and check it out. The TriLife crew were excellent (Mike, Dan, and Dean) as were the Ironman team (Richard the Race Director, Dan the UK COO, and the chap who is going to be in charge of the aid stations). 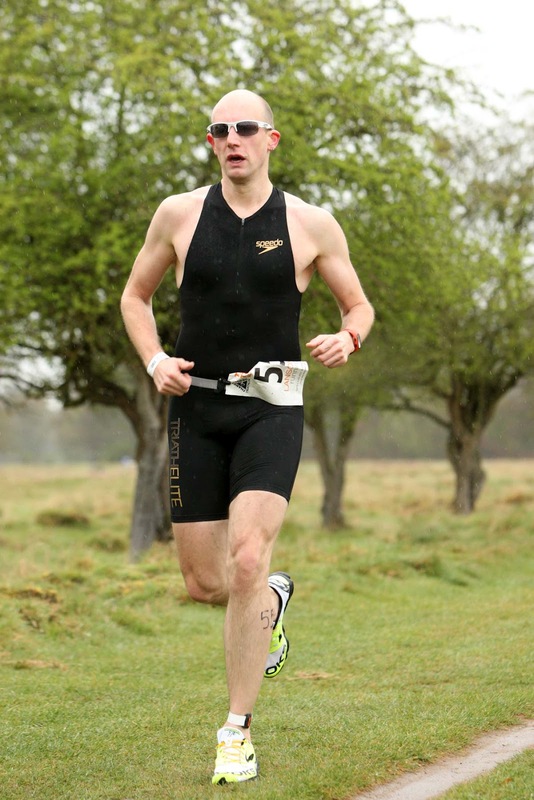 We were also joined on the day by Sam Baxter, a top age-group triathlete who placed 7th in his age group at Kona in 2011 - his insight into racing at the highest level was invaluable. There's an interesting piece on Sam here. Massive thanks to them all, and of course to Anne and John at the Anchor Inn. Mrs and I can't wait to see all of you again in seven weeks' time when we'll be doing it for real! I don't normally buy race photos - but I couldn't resist these two. I'm certainly looking leaner than last year (though at between 7kg and 10kg lighter I should damn well hope so!). The full set of photos are available to take a look at http://www.philoconnor.com/ - select "Sprint Series Race 1" under the Thames Turbo logo, and search in the top right box for number "055". I can't link directly to my pictures, they don't allow that. An incredibly busy period at work means that it's been hard to find time to talk about my training, but try as it may work hasn't stopped me getting out and getting some miles in. Running and cycling have gone well, swimming has been my challenge, but it's starting to come together - albeit slowly. Firstly, check out Mrs' Race Report. Secondly, let me start out by saying I love the sprint tri series organised by Thames Turbo Triathlon. There are 4 held each year, on every bank holiday Monday. I completed them all in 2010 and 2011, and today was the first of 2012. They have a great atmosphere, and feel really inclusive - particularly to first timers. During the race briefing the first-timers are asked to raise a hand - it seems like there are always about 1/3 first-timers. I love events like this - a fun mix of those not knowing what to expect and being there for the challenge of the event, to groups of enthusiastic amateurs trying to set a new PB or shave a few seconds off transition (I'd put myself in this category), right up to accomplished club athletes who are there to stamp their authority all over proceedings. Last year Mrs and I were caught out when we learned that Race 1 in the series was also the first race in the London League - so there was a really strong field. This year was the same - so there were a few more lean and serious looking athletes around, as well as a few more spanky bikes with trick bits and disc wheels than usual! My training this year is targeted towards the 4 Ironman races, but this sprint series represents a good general fitness data point, and I'm hoping to see an improvement over last year given I have 3 months of focussed training in the bank, and over the last two years I'm not sure I've even managed 3 weeks of sustained training effort. There are a few changes in the course this year. Transition is in the same place, but Swim In, Bike Out, and Run Out have changed sides. This makes for a slightly fairer and more logical route through as you move from left to right twice - picking your bike up the first time, and dropping it off the second. 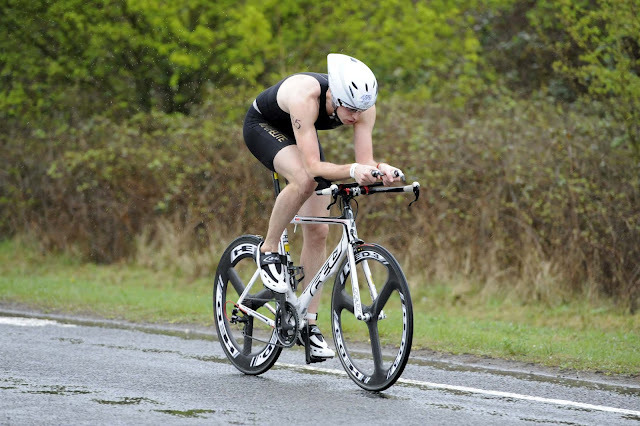 The swim, run, and bike courses were all the same (if you want to be picky, run was very slightly different as a corner had been cut and a few metres added on to the finishing straight to compensate, but there's no need to picky now is there?). The two biggest changes by far are Sunday evening registration and chip timing (provided by Race Timing Systems). You can now register up at Hampton Pool between 5pm and 6pm on Sunday night. This should alleviate some of the bigger queues in the morning - it did get quite crowded at times and this year they are allowing slightly larger fields. We drove up to pick up our packs (wrist band, race number, bike and helmet numbers, and the all important timing chip) and the place was packed. This would have been a big help to organisation in the morning. The timing chips have been mooted for some time, and it's great to see them now deployed. They placed sensor mats at T1 entrance and exit, bike finish, T2 exit, and run finish - this means we finally get splits for each discipline individually, as well as both transitions. An excellent improvement (previous manual timing meant we got three splits - swim + T1, bike, and T2 + run) , thank you Thames Turbo. Race day comes around, and we're up at 4:50am for some porridge. The weather was not kind. On top of my tri-suit I wore bib-tights, long socks, a long sleeved base layer, a fleece jumper, and then winter gloves, overshoes, and a waterproof outer layer. I was dressed more for an arctic expedition than a 35 minute warm up ride to the event. With Mrs pulling off a similar Michelin Man impression, we set off - lights a-blinking from makeshift mounts. We arrived at about 6:20am, just about the right amount of time to get all set up in transition and ready for the off. Mrs was numbered 35, and I was 55. Competitors start at 10 second intervals from 07:00, so she was due to leave at 07:05:50, with me 3:20 later. In short - it was cold. Damn cold. And very rainy. And cold. As I was queuing for my swim start I seriously thought we'd made a mistake not leaving clothes to put on during T1. It takes a long time to do this, but it's better than freezing to death! Anyway, too late now. I watched Mrs start, she seemed to settle quickly and be swimming well. I noticed the first few exiting T1 with long sleeved tops and waterproof shell layers on. I fretted a bit. My swim start came, but with about five people left in front of me the timing start broke, so we were held for a few minutes while they got it sorted out (it was too wet and so the touchscreen stopped working - a replacement was quickly found). When I finally stepped into the 28C heated pool it felt like it was boiling thanks to the differential with the air. My swim was poor. I set off and within seconds lost form, regressing immediately back to my old stroke - but as I hadn't been swimming like that for months, I was uncoordinated and inefficient. I failed to tumble turn at the first turn (in the deep end) as I had no gauge as to how close the end was, and by the end of the second length I'd already been overtaken by the person behind me. I focussed hard on trying to think about what I was doing, and did get some rhythm back - but it's clear I need practice, practice, practice to really ingrain my new stroke. It's not there yet. I lost another 3 or 4 places in the first half. My breathing stayed controlled and I wasn't getting tired, so at least I was being slow efficiently! Swim time was 08:31 for the 12 lengths (432m). T1 took 01:00 on the clock. I had decided to try attaching my shoes to the bike, then holding them in place with elastic bands. This meant a quicker T1 as you don't have to put any shoes on. Instead, once you've set off on the bike, you slide your feet in. The theory is that if you put your shoes on while you're moving, it'll be quicker than putting them on while you're stood still. It was still raining heavily, so my helmet had filled with water and gave me a cold splash as I flipped it onto my head. Thanks, but I'm already awake. 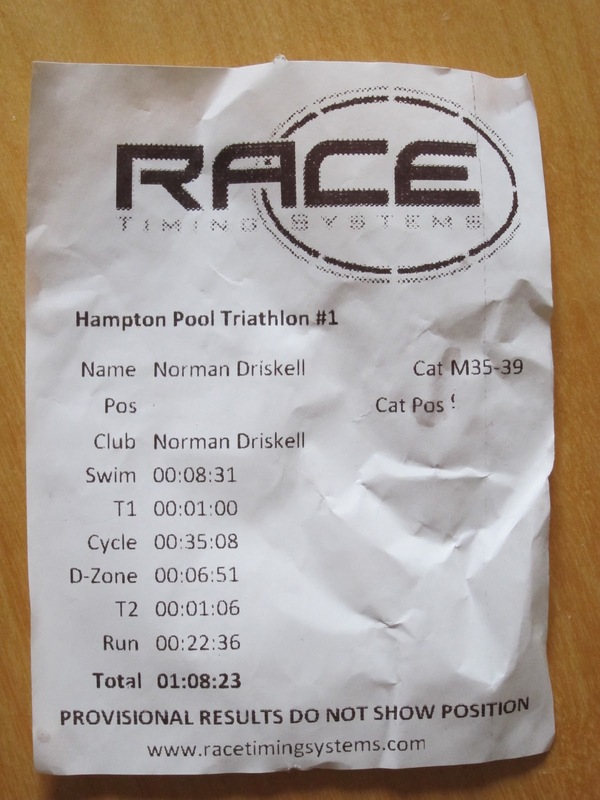 My previous PB swim + T1 time was 09:27 - so to I was surprised to see 09:31 in the results today, only 4 seconds down after what felt like a slow swim. Clearly my T1 had been good. Off into the rain for the bike leg. I got my shoes sorted out and settled down for the 20km cycle (actually about 21.5km). The bike felt good. Really good. My position has felt a lot more comfortable on the couple of training rides I've had this year - I suspect due to having a lot less round my middle (I'm 6.8kg lighter than race 4 last year, and a massive 11.3kg lighter than I was for race 3 last year). I kept my cadence a little higher than I have had in the past - for triathlon cycling if you can keep your legs turning over a little faster than you would when doing a straight cycle time trial, it should help in the run, particularly at the outset. I was going fast. It felt really fast. I flew past quite a few people (I don't know how many). Stayed on the tri-bars almost the whole way (exceptions being to brake for a car, and to make the two 180 degree turns at the end points of the course). In previous races I've felt my power decline over the last 10 minutes of the ride, but not today - I felt strong and even found myself pedalling out a bit (when you can't pedal fast enough in your gear for the speed you're going) and so notched up a gear or two to really push to the end. My time was 35:08 - a massive 01:12 off my previous best. I don't get speed/cadence data from the polar I wear for racing which is a real shame, I would have liked to see a comparison of this race with the last. I suspect the speed would have been comparable for the first 1/2 to 2/3, but then sustained rather than dropped off. I also feel like I was in control of breathing and heart rate during this leg, and I suspect was riding more efficiently. This is good news when there's a run to come, traditionally where I come unstuck. The Thames Turbo races have a peculiar idiosyncrasy in that the bike finish is a km or so from transition, and therefore there's a "non-compete zone". This permits a maximum 7 minutes from passing over the bike finish timing mat to get back to the pool and pass over the T2 start mat. A smart competitor will take full advantage of this time to drop into a low gear, spin the legs round, and get your heart rate back down. I caught Mrs right at the end of the bike, so we bimbled up through the non-compete together. As a result I took almost a bit too much advantage of this and clocked 06:51 in the non-compete zone. If you go over 07:00 then the clock automatically restarts and the time is added on to T2. My T2 time was 01:06 - mainly due to my hands being so cold I couldn't get my running shoes on properly, or unclip my helmet. Got there in the end, and off for the run. Over the last few months I've been working hard on my running technique and developing a more mid-to-forefoot strike. This reduces the shock and pressure on your legs when you run, and also supports an increased cadence and more efficient style. As a result I decided to get some lighter shoes with a little less heel cushioning for short distance races. I picked up some Brooks Racer T7 from Sweatshop using their now, sadly expired, buy-one-pair-get-another-for-£25 offer. This was their first proper race outing, and I was not disappointed. I managed a quick turnover right from the start, I felt light on my feet and strong (despite the freezing cold and rain). I kept good cadence for the run, and even overtook a few people (normally people stream past me on the run - all the people I'd overtaken on the bike!). I hadn't thought about my watch at all - but remembered it just before the 4km marker. I had a quick look, it read 01:09:something - I knew I'd spent about 6:45 in the non-compete zone. Therefore I had about 6 minutes to finish, and still get in at under 01:10:00. I started to think - 6 minutes was generous for a km, if I could get in under 5 minutes I may even break 01:09:00 - that was my "wildest imagination" time! I pushed on - and really opened up over the last 500m, putting everything I had into the last couple of hundred. Race over. But what was my time? I was gobsmacked - I suspected I may have broken 01:09:00, but to clear it so convincingly made my day! Cant wait for race 2 - 4 weeks to go! Check out the online results tool! A fantastic first triathlon of the season. Thanks Thames Turbo, thanks Marshals (all 60 of 'em! ), and thanks Mrs for also being into this crazy sport that means we both have someone to get up with at 04:50 on bank holiday Mondays in the cold and rain.